Here, data is a two dimensional integer or float array of shape (number of rows, number of columns). metadata is a dictionary which provides metadata from the files header section, e.g. using the keys producttype, datetime, intervalseconds, nodataflag. The RADOLAN Grid coordinates can be calculated with wradlib.georef.get_radolan_grid(). 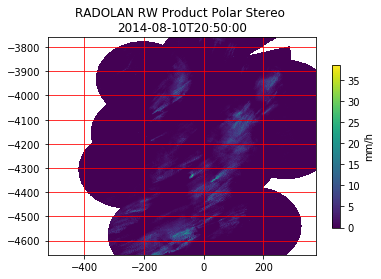 With the following code snippet the RW-product is shown in the Polar Stereographic Projection. Import modules, filter warnings to avoid cluttering output with DeprecationWarnings and use matplotlib inline or interactive mode if running in ipython or python respectively. /home/travis/miniconda/envs/wradlib/lib/python3.6/site-packages/h5py/__init__.py:36: FutureWarning: Conversion of the second argument of issubdtype from `float` to `np.floating` is deprecated. In future, it will be treated as `np.float64 == np.dtype(float).type`. A much more comprehensive section using several RADOLAN composites is shown in chapter RADOLAN Product Showcase. © Copyright 2011-2018, wradlib developers. Revision 65d6c3b8.